Of course, even if this does happen, your previous greatness will have generated a lot of legacy (a topic for another diary), ensuring your reputation lasts – and that you have a good chance of winning the game despite your current problems. In Empires, with this ebb and flow, and added difficulty in maintaining stable large nations, nothing is a given. As you all know, the Roman Empire had its times of crisis, some minor, some more serious, to the point that it was, sometimes, on the edge of collapse much earlier than the date it did collapse historically. But it recovered, more or less, several times and the Western part lasted centuries, until 476 CE. All the while, it managed to expand from Scotland to Mesopotamia. And yet, over time it suffered many civil wars, usurpers and rampant inflation. This is what we aim to simulate, albeit in perhaps a gentler, less frustrating way, in Empires! We want you to consider, seriously, that your nation is a complex, fragile construct. If you manage it well through several simple yet subtle mechanisms, then -- most of the time – things will be all right. If you throw caution to the wind, by conquering rabidly and neglecting the welfare of your citizens, then there will be an internal reaction that sends your nation into turmoil and revolts. Ok after this long preamble focusing on the core design principle, let’s get practical! One of the very important measures of the progress of your nation is the Culture of each region. It comes from assigning your population to the Culture task, supplemented by your buildings. As with other types of ‘production’, this can be further modified by traits at the national level, from your ruler, government, etc. At the national level, there can also be events that change how much culture you generate. An artistically minded ruler can lead to benefits across the nation. Culture is pivotal to the game, because it serves many purposes. The most straightforward and direct usage is ‘welfare’, a bonus to loyalty, which you get if you have population assigned to Culture production. Thus you can offset unrest by placing your population in ‘unproductive’ (compared producing food or money) activities. There is a limit to how much bonus to loyalty you can get from welfare, so this tool has its limits, but it works well as a ‘first line of defense’ against discontented and demanding citizens. Because, as you might have guessed, citizens, and population in general, are not always fully happy with their condition. The more numerous the population of a region is, the lower the loyalty will be, due to citizens expecting services, welfare and entertainment. Slaves bring different challenges in this respect compared to citizens. They, oddly enough, want to change their condition by revolting, or at least escaping. This too lowers the overall loyalty in the region. And when loyalty is too low, you can get revolts, either from the slaves, or from the citizens. They might even turn back to their former nation or master, if they are not from your main ethnicity. People are so ungrateful! The second, slightly less direct use of Culture, is to fight off Decadence. 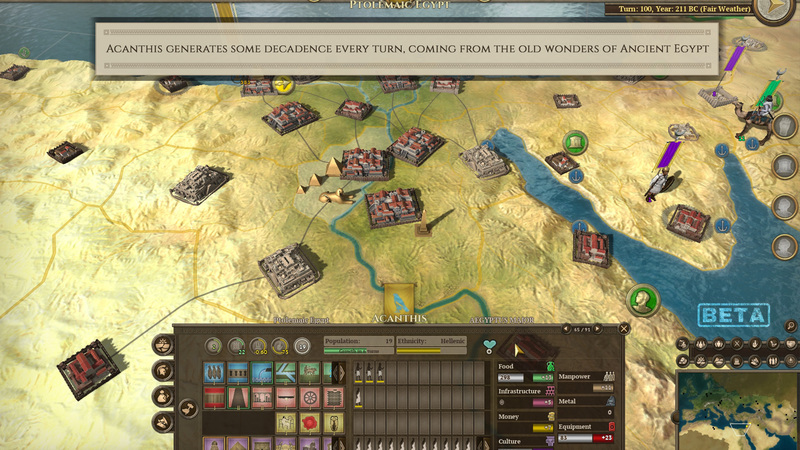 Decadence in the game appears under several conditions. First, as your government grows older, some decadence appears over time. Second, when your nation grows and conquers other people, you get extra decadence, coming from the turmoil and instability of having to assimilate new territories. And then you have what your nation is made of, its infrastructure. Some buildings are very nice and will greatly help you, but they come with the cost of generating decadence over time. And so, you have on one side the overall culture of your nation, and on the other side its decadence level, giving you a ratio between them. If the ratio is good, you are a nation that is progressing in terms of civilization. This ratio is compared to all the other nations in the game and will place you into one of three ‘tiers’. At the top, you have momentum and perhaps you might even be qualified as being glorious, like the ‘Glorious Roman Empire’. Then there are other nations that are in the middle of the chart. For them, nothing special. They can go either way. And then there are the ones losing ground, in term of progress. For those in the bottom tier if they do nothing to deal with their problems, bad things will happen. All of these effects are very gradual. You don’t switch from being a young and dynamic empire to a crumbling kingdom made of senile senators and pampered citizens in a few years. You’ll have time to react and adjust, but doing so may demand considerable effort though! All this leads to the status and civilization level of your nation. Your status can be ‘young’, ‘stable’, ‘glorious’, ‘old’ or ‘decadent’. Civilization level gives the tier of your government. For example the Republic is a civilization level II government, as is the Monarchy. And an Empire is a tier III government. Status and Civilization level are combined, depending of your progress in civilization and how decadent you are. It is entirely possible to be the ‘Glorious Roman Republic’ but later on the ‘Decadent Roman Republic’. It will depend on how well you handle the progress and decadence of your nation. There are rewards from being a nation progressing through the civilization levels. As time passes, if you maintain a glorious status long enough, then you might evolve to a new civilization level. And this is how the Republic might transform to an Empire for Rome! And then if you are already at the top civilization level, being again Glorious has its own reward, with the fabled Golden Age! This is where we have almost come full circle back to our loyalty issue we talked about initially (as you can see the game features mesh with one another). It won’t be possible, if you want large populous regions, to fight off disloyalty only with the welfare bonus from culture. You’ll need something else. It happens that we have a lot of buildings in the game (400). 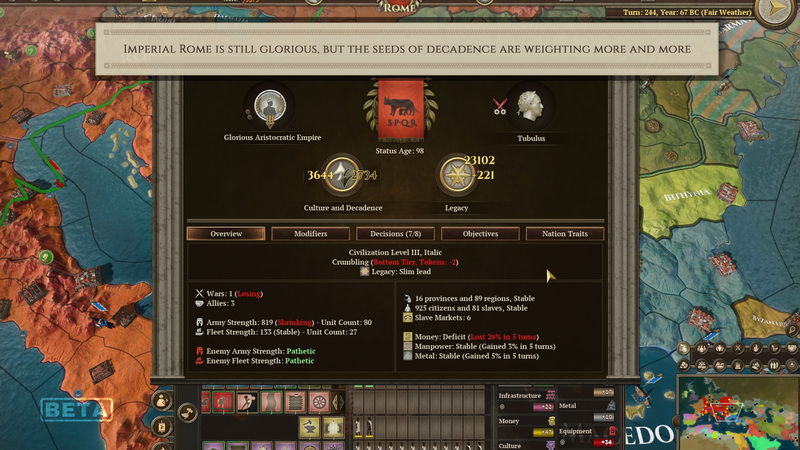 Several of these (circuses, gambling rings, theaters, noble districts, brothels, monuments, gladiator arenas, etc) will greatly boost loyalty in your region. In a very ‘panem et circus’ way of the Romans (we want bread and games!). The only issue with these buildings is that they generate decadence over time. And so we are back to the problem of fighting off decadence. We said earlier that we did not want to be too punishing and frustrating, it’s a game after all. 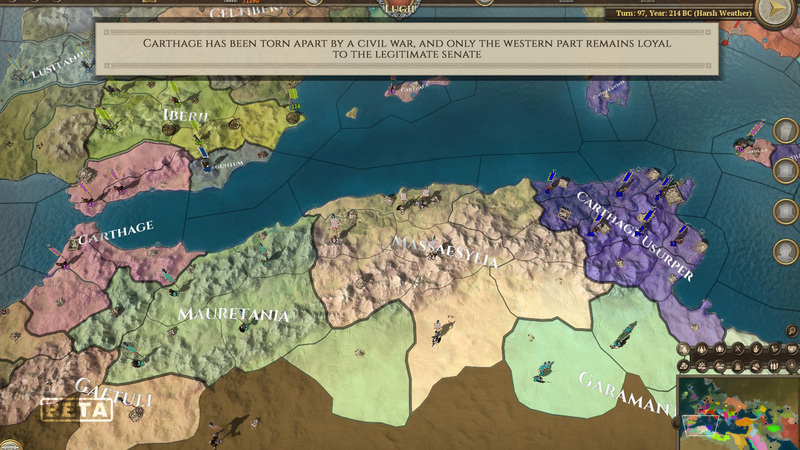 Depending of your difficulty level and rate of expansion, it will be entirely possible for a player paying some attention to his empire to avoid the more acute crisis that struck the roman empire (civil wars mainly). But you’ll have to make choices and be watchful of your expansion rate and how your citizens feel. Failing that, a usurper is always around the corner! Field of Glory Empires is on Steam! Wishlist it now! 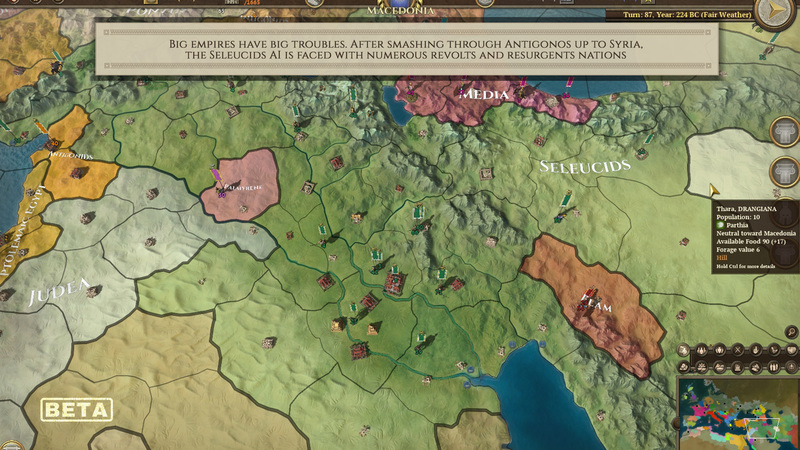 Hi and welcome to the 5th developer diary for Empires, our upcoming grand strategy game set in the Ancient Era. Governments come and go, but nations stay. Well not always, these too can disappear in Empires, although we will only brush lightly on this subject today, as it will be the topic on our 6th diary when we turn our attention to culture and decadence!